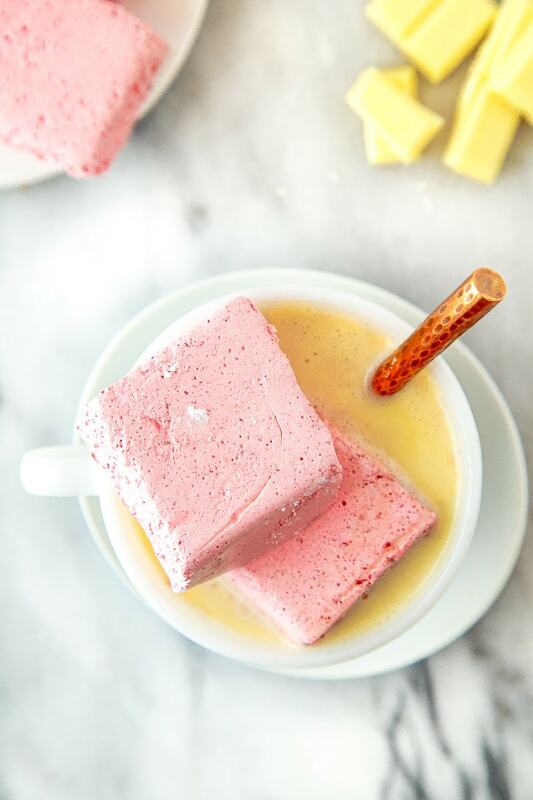 I’m not about to share a recipe for raspberry marshmallows, and then not give you something boozy and delicious to float them in! I made white hot chocolate the other day, because I’ve always loved the white stuff more than the dark stuff. I made a few cups of it, and then finally reached for some booze to jazz it up. My first grab was peppermint schnapps, which was fun— stir it with a candy cane, and you’re basically drinking peppermint bark. But my next reach was Chambord. I love the black raspberry liquor from France called Chambord. It’s pretty delicious in almost anything. Especially in white hot cocoa. Especially when that white hot chocolate has raspberry marshmallows floating on top. Raspberries and white chocolate were made for each other. This reminds me of my mini mason jar tarts with white chocolate and raspberry jam swirls. But, I may even like this more because: booze. I’m going to leave it up to you to decide just how much raspberry liquor to add. The only thing is–you must add it at right before serving, or it will curdle. So, do a little sip sip, pour, sip sip, pour until you get it juuuuuuuust right. My final plea is to use real white chocolate. Not the chips. Chocolate chips are designed not to melt, so buy a bar of your favorite white stuff (mine is Lindt), and let it slowly melt into the milk. Chop the white chocolate into 1/2" pieces. Warm the half and half over medium heat in a small saucepan. Let a few bubbles form along the edges, but do not let it boil. Remove the pan from the heat, and stir in the chopped chocolate. Cover, and let sit for a few minutes to melt the chocolate. Remove the lid and stir. 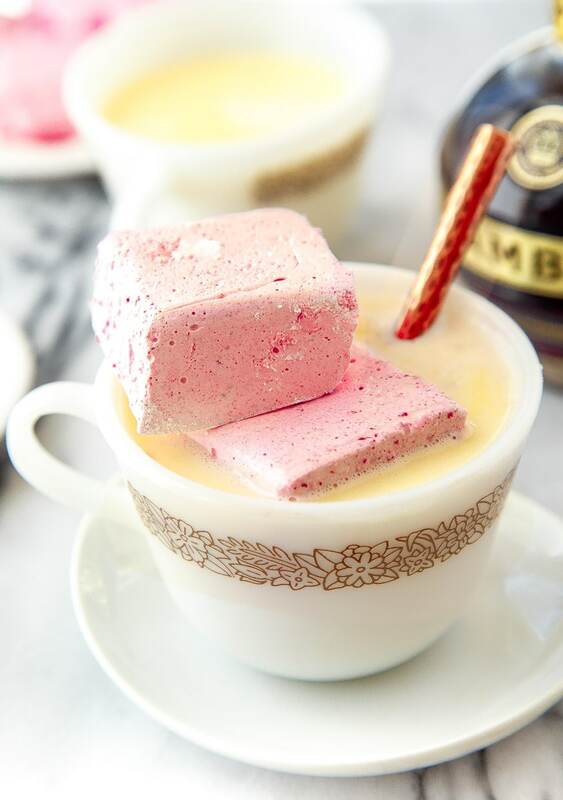 Divide the mixture between two glasses, add a shot of Chambord to each, and serve with raspberry marshmallows. Baby Food, Breakfast, Gluten Free, HEALTHY! This looks delicious! 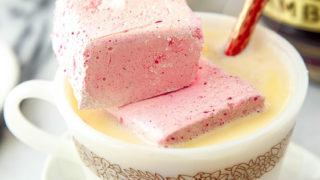 and I mean, I can’t really resist the idea of a Chambord infused white hot chocolate with pink marshmallow clouds on top! I agree, Lindt is the best!! 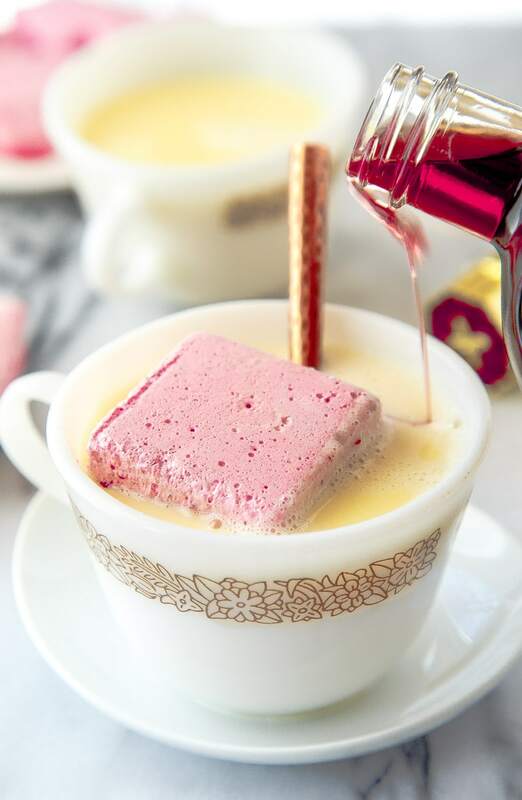 I save all the white truffles from my holiday box to make special desserts :) I do not know what I love more, the raspberry marshmallows or the hot cocoa! I love everything about this! not to mention it’s one of my favorite flavor combos. …..those raspberry marshmallow – sigh!! pinning! Wow! Just look at that! After all of the heavy dark chocolate Christmas fudge, cocoa, cookies and pudding, this a stunning and delightful picture to see indeed! It sings to me that spring might be making an appearance sometime our snow! Thank-you for the glimmer of hope! And how bout a sip of the Chambord from the shot glass, then a sip of the hot white? I’m a v e r y slow sipper? The combination sounds so wonderful I’d hate to skip it altogether! only you could get away with drinking half and half. OMG! It sounds great. I LOVE white chocolate!! My wife bought me a pound of them from See’s Candy for Christmas and there’s about 2 left I think…oops! Ohhh this sounds so cozy! I would love to have a cup of this and I like the raspberry twist to it! It has been ages since I had Chambord, please remind me what it taste like. When we have another day of deep south winter I will make white chocolate, too!! Thanks everyone for sharing!! hi, can we use vege gel instead of gelatine? Oh my…looks so fabulous. I am dying for those marshmallows!